I’d say Pinterest or Google any ideas you may have of what you’d like to do to get ideas. With aesthetics what one person perceives as great another wouldn’t. Personally colour coded bolts look horrendous. Sorry i can’t be more helpful. Ask any questions. Performance exhausts (Carbon cans) 45mm will suit nicely and an ECU chip to suit. Aftermarket air filters to replace the stock ones. Single seat unit and remove the rear foot peg hangers. Then carefully store the original equipment. Hey thanks for the useful info! I’ve started slowly with new fluid cap fillers . 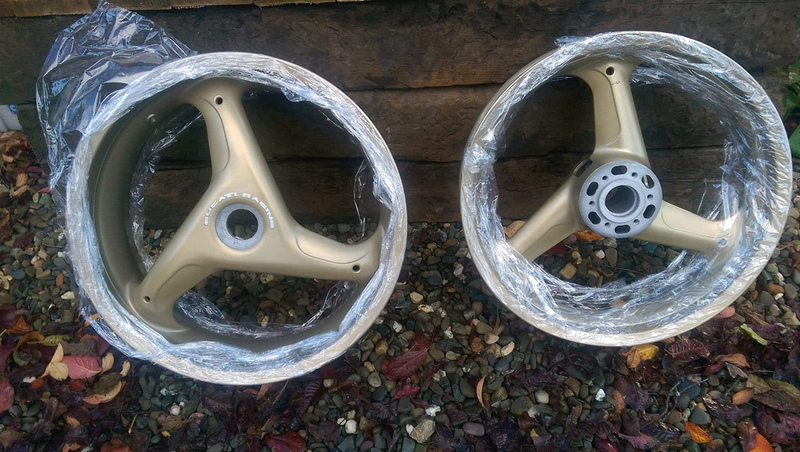 Are you looking at getting your standard wheels re-done gold? Speak to Mark at MADASL (tell him I sent you) and he will give you all the details and a timeline. It is the closest I have see to the standard colour.